Rega announces new Planar 8 turntable inspired by its £30k Naiad deck | What Hi-Fi? 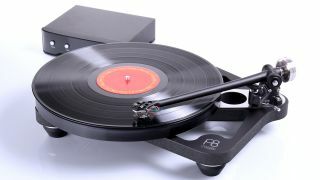 Rega has announced the arrival of the newest member of its turntable range, the Planar 8. The Planar 8 is available cartridge-free (£1699), or with with two factory-fitted cartridge options: the Ania (£2119 total, already available with the Planar 6) or Apheta 2 (£2439 total, an existing option on the RP10). Rega says the Planar 8 was inspired by the Naiad, the £30,000 turntable that Rega launched in 2013 to celebrate its 40th anniversary, as opposed to simply being an evolution of the RP8 (its predecessor). A Naiad at a more affordable price, then? Rega sure thinks so. The Planar 8 features a new RB880 tonearm, which now has an improved vertical bearing assembly for enhanced stability. A thinner stainless steel balance weight is used for greater adjustability, a new bearing assembly promises friction-free movement, while its also connected to a new phono cable. There's also a new Neo power supply unit, which offers electronic speed change and anti-vibration control for more control over the motor, and uses a digital signal processing generator to ensure the platter turns as accurately as possible. The Planar 8 is supposedly 30 per cent lighter (yet more rigid) than the original RP8. That’s thanks to a number of factors, one of which is the use of the company’s latest lightweight Tancast 8 polyurethane foam core (also utilised in the Planar 6), which is sandwiched between two layers of laminate. Rega has collaborated with a British glass engineering company to produce the Planar 8’s three-piece, laminated glass platter, which it says keeps as much of the mass to the outside rim of the glass (where it should be), reducing the mass on the inside. A lightweight plinth, combined with a double brace mounted between the tonearm mounting and the main hub bearing (where the increased rigidity is required), prevents energy absorption and unwanted resonances and, thus, distortion in the delivery. In place of the its predecessor’s outer frame is a new and removable single-piece dustcover that reduces the Planar 8’s overall mass, too. The Planar 8 uses a new low mass central bearing assembly, as well as a new bespoke rubber belt - the result of three years of R&D, apparently. Like its peers, the Planar 8 can be attached to a wall with a new dedicated bracket. Due to its footprint, it isn’t compatible with the current Rega wall bracket. The Planar 8’s shipping will begin in the UK this month.